Provide comfort for the family of Gladys Black with a meaningful gesture of sympathy. Worley-Luginbuel Funeral Home, Grove, Oklahoma, 98-786-2261. 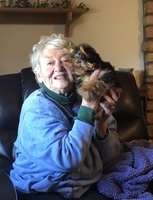 Gladys Irene Black left this earth after a long battle of Alzheimer’s on April 9, 2019 at Grand Lake Villa Nursing home with her family by her side. Gladys was born on October 4, 1930 to Samuel and Bertha (Martin) Hoffman in Grace City, North Dakota and grew up on their family farm with her nine brothers and sisters. Gladys later married Gerald T. Black and they had two children, Loneise and Billy, later they settled in Grove in the late 60’s. Gladys was a homemaker, an avid gardener, loved to fish, hunt for mushrooms and wild onions, and spending time outdoors. Gladys was preceded in death by both parents, 6 siblings and her son in law. Survivors include her daughter Loneise Tanner, son Bill Black, grandchildren Angie Shepherd and husband Frankie, Taylor Tanner, Trevor Black and wife Amy, great grandchildren; Kaylee and Emmy Shepherd, Carly Kiersten, Cassie, Reed and Carson Black. She is also survived by 2 brothers, 1 sister and many nieces and nephews. A visitation for family and friends will be held from 2-4PM, Sunday, April 14, 2019 at the Worley-Luginbuel Funeral Home Chapel. Services will be held at 1:00 PM, Monday, April 15, 2019 at the Foundation Freewill Baptist Church with Pastor Sam Smith officiating. Gladys will be laid to rest in the Zena Cemetery. Online condolences can be made by viewing Glady’s Book of Memories at www.honoringmemories.com or on the Worley-Luginbuel Facebook page. To send flowers in memory of Gladys Irene Black (Hoffman), please visit our Heartfelt Sympathies Store.